MSC Cruises is to briefly base its Fantasia-class ship, MSC Preziosa, in Southampton between September and October 2017. The five round-trip itineraries are identical to those to be sailed by MSC Splendida later this year, with calls to Zeebrugge (for Bruges), Amsterdam, Hamburg and Le Havre (for Paris). A repositional cruise between Southampton and Genoa in October is also available, calling at La Coruna, Lisbon, Gibraltar, and Barcelona. Not only will this be the first time MSC Preziosa will have called at Southampton since its launch in 2013, it will also be the largest ship the cruise line has sent to the British Isles. In addition to releasing the itineraries above, MSC Cruises has also published its brochure for 2017/18. MSC Armonia, MSC Orchestra, and MSC Splendida will all spend the summer season sailing seven-night itineraries around the Mediterranean. In winter, MSC Armonia will reposition to Havana sailing 14-night itineraries to Mexico and the Caribbean. MSC Orchestra will head to Barbados and will operate 14-night Caribbean tours. 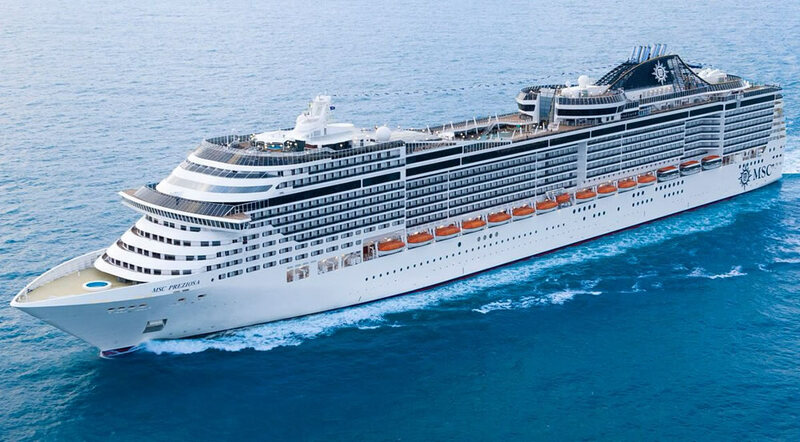 MSC Splendida will reposition to Dubai operating seven-night cruises to Oman and the United Arab Emirates. MSC Opera will continue sailing weekly itineraries from Cuba, and will begin calling at Ocean Cay Marine Reserve, MSC Cruises’ new private island in the Caribbean, from December 2017. The week-long itineraries can be combined to form a 14-night back-to-back cruise. MSC Meraviglia will enter into service in June and spend its inaugural season also sailing seven-night Mediterranean itineraries. MSC Seaside, the line’s second cruise ship launch of the year, will operate 14-night back-to-back itineraries to Mexico and the Caribbean from December, including calls to Ocean Cay Marine Reserve. From Venice, MSC Musica will sail seven-night itineraries to the Adriatic and Aegean Seas while MSC Sinfonia will sail on seven-night itineraries to the Greek islands of Mykonos and Santorini. MSC Poesia will also sail seven-night itineraries from Venice but will instead head to Izmir and Istanbul, Turkey. In the autumn, MSC Magnifica will sail nine-night itineraries from Genoa to Morocco, while MSC Fantasia will spend its autumn and winter seasons sailing 12-night itineraries to the Canary Islands, 10-night Mediterranean voyages, and 11-night itineraries to Greece. MSC Divina will continue to be home-ported in Miami, sailing back-to-back 14-night Caribbean and Mexico itineraries. From January 2018 the ship will sail on a series of 10- and 11-night cruises from Miami that will include calls to Ocean Cay Marine Reserve.